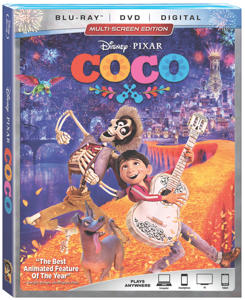 If you pay attention to the Oscars, you may recall that Disney’s Coco won the best animated feature film award for 2018 recently. The folks over at Disney recently sent us a copy on DVD to watch at home. Keep reading for my thoughts on the Coco, as well as a chance to win a copy for yourself. Coco tells the story of 12 year old Miguel and his passion for music, despite his family’s almost 100 year old ban on it. His great-grandmother, Coco, and her mother, were seemingly abandoned by Coco’s father, who was pursuing his dream of musical fame. She was forced to raise Coco by alone, eventually teaching herself the shoemaking trade. In retaliation for the heartache music caused her, all forms of music had been banned. Taking place in the days leading up to the Mexican Day of the Dead celebrations, Coco is full of vibrant colours and toe-tapping music. Falling just short of an all-out musical, I enjoyed watching this animated film. The main theme is definitely the love and strength of family. The old adage that ‘the truth will set you free’ is also an interesting one. It’s always sounded funny to me to talk about a plot twist in a cartoon, but it really is what brings the entire story full circle. Despite the majority of the characters in the film being skeletons, none of my kids suffered any ill effects. I’m not sure if this is some sort of household milestone or a more a reflection of how well this film has been constructed. Despite being dead, none of the scenes are scary or threatening. Even the bad guy doesn’t seem so bad. Quite possibly my favourite part of Coco is not even in the movie. The interviews with the directors, Lee Unkrich and Adrian Molina, offer a fascinating look into the amount of work that was put into replicating the Mexican culture. It is well worth the extra viewing time. Using the Rafflecopter form below, you can enter for a chance to win a copy of Coco on Blu-Ray/DVD. Open to Canadian residents only. Odds of winning will depend on the number of eligible entries received. Not responsible for lost or misdirected entries. Contest closes March 21, 2018 11:59 pm ET. Good luck everybody! 34 Responses to "A Chance For You To Win Disney’s Coco"
I only know a little bit about Dia de los Muertos. I don't really know much, but what I do know I learned when I went to this movie with my grandson. Absolutely loved it! I know a bit after hearing about this movie, but not enough to tell anyone about it. I lived in Mexico for a few years and participated in Dia de los Muertos activities with my friends families. It was interesting how some of the younger kids would also have small "Halloween like' events on Halloween, but on the November 1st, everyone went to the cemetery! I have never heard of Dia de los Muertos before. I only know a little bit about it. I know a little bit about Dia de los Muertos. I don't know much about Dia de los Muertos. I know pretty much nothing about Dia de los Muertos, a big reason why I can't wait to see this movie! I actually don't know anything about Dia de los muertos. Honestly,I know nothing about Dia de los muertos! I don't know anything about the Dia de los muertos! I don't know anything about it and could use the education. To be honest, I know absolutely nothing about Dia de los Muertos. I know a little bit from my students who are from Mexico! I knew a little but Coco was a great way to explain it. This helped immensely when our 4 year old lost her GPA . It's not as sad now that she knows he's with the ancestors. I know nothing about Dia de los muertos! I really know nothing about Dia de los Muertos. I have never heard of Dia de los Muertos before. This movie looks so good though! I honestly know nothing about Dia de los Muertos. I didn't know anything about it until I saw Coco with my daughter! Absolute zero about Dia de los Muertos. That would be a big zero. I don't know much about it!